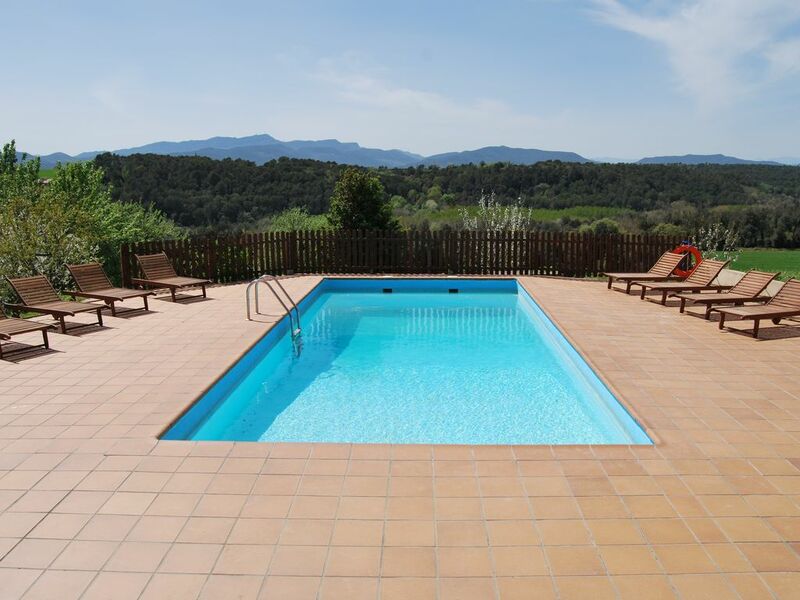 Ca l'Armengol is an old farmhouse from eighteenth century (isolated) with fabulous views and very well located for sightseeing, near the sea and the mountains, is ideal to relax and disconnect, enjoy nature, as well as the pool and barbecue. It is close to beautiful cities like Barcelona, Girona,Figueres... with plenty of experiences. It is relevant panoramic views from the different points of the house by its raised position, being especially lovely sunsets and sunsets. The artists who have gone through Ca l'Armengol have always valued the uniqueness of the place. The wonderful outdoor space is available to all guests, allowing recreation with family and friends. The house is in the ground floor, sleeps up to 4 persons (2 rooms) with separate entrance and private garden, terrace. There are 2 bedrooms, (one is a double room and the other has 2 single beds),2 bathrooms with shower, a fireplace, living-room with smartTV and a totally equipped kitchen. All rooms are exterior and equipped with necessary household items. The price includes bed linen, towels, use of BBQ (wood and coal) and pool plus wi-fi. We also inform you that the family responsible for the activity of rural tourism is living in a different part of the farmhouse being more flexible with check-in and check-out time and giving an inmediate service during the stay. There are 2 accomodations in the farm sharing BBQ, swimming-pool and table-tennis, trampoline, etc. Each house has its own entrance and private garden. Location: The house is very easy to access, it is located in the center of Pla del Estany, next to Banyoles and near Barcelona. It is well communicated and proves to be a strategic starting point for your excursions and cultural or gastronomic visits throughout the region. At less than 25 km we have Girona, Figueres, Besalú, ... and the best beaches of the Costa Brava, with fine sand and very shallow waters ideal for children. Very well located house, near Girona Airport, Figueres, Costa Brava, Banyoles, etc. Cada cuarto de baño dispone de baño, lavabo y ducha.